Where: Northwood Middle School, 13120 N. Pittsburg St.
A new Costco warehouse store north of Spokane city limits is nearing reality, as is a proposed roundabout that would provide customers access off U.S. Highway 2. The development agreement signed in 2010 by Kaiser Aluminum, owners of the land where the new store will be built, called for construction of a stoplight or roundabout to enter what is planned as a 424-acre development north of the old smelter. Traffic studies indicated a roundabout would be safer than a stoplight, but residents in the area have expressed concerns about two roundabouts that have been proposed, said Spokane County Commissioner Josh Kerns. “I suspect, with the way folks have contacted me about roundabouts in other locations, they are not going to be happy on a roundabout on a two-lane highway,” said Kerns, who opposes the proposed roundabouts, which would be located along Highway 2 at Day Mount Spokane Road and at state Highway 206. The Department of Transportation, which has argued that roundabouts are safer, cheaper and more environmentally friendly than stoplights, will hold an open house Wednesday from 5 p.m. to 7 p.m. at Northwood Middle School, 13120 N. Pittsburg St., along with representatives from Kaiser and Costco to discuss the plans and timeline for construction. A representative from the Issaquah-based retailer’s corporate office would not comment on a construction timetable, saying Costco’s policy was not to discuss new stores until construction has begun. But the company has filed detailed drawings of its new, 167,000 square foot warehouse that would take a lucrative sales tax generator out of city limits and into Spokane County. “They want to get it open as soon as they can,” said Gerry Gemmill, chief executive officer for Spokane County. Costco is expected to move from its current location, a 134,000-square-foot facility on Division Street that opened in October 1992 and was remodeled in 2007. The location became a flashpoint for political controversy between the city and county around the time of the remodel, with the city eventually annexing the store location and other properties along Division in 2008 as part of an agreement to end a lawsuit filed by Spokane County. As part of the annexation, the city and county agreed to share portions of the sales tax revenue from the store. Costco does not release the specific sales tax figures brought in by each of its stores, but industry publications put the figure close to $1 million annually. City Council President Ben Stuckart said there had been no discussions about annexing the site of the future store, and City Planning Director Lisa Key said the city’s current borders, ending at Highway 2 and Hawthorne Road, rendered any future annexation difficult. Lydig Construction, a firm with branches in Spokane, the Tri-Cities and Bellevue, has signed on to construct the warehouse and a fueling center near the current intersection of Highway 2 and Pittsburg Street, on an undeveloped 19.6 acre lot on the east side of the highway. A Lydig representative referred construction questions to Costco. The proposed site of the warehouse avoids a groundwater plume identified by the Ecology Department containing fluoride and cyanide, byproducts of the smelting process Kaiser performed near the site for years, county and Kaiser officials said. The department still is monitoring groundwater contamination there and developing a plan to reduce the level of chemical remnants, following observations that showed concentrations well above safe levels established by federal regulators and in a cleanup agreement that was developed during the Kaiser bankruptcy. Workers capped buried 128,000 tons of waste material from the smelter with asphalt in 2001, according to documents filed by the Ecology Department. Costco wants to buy the land from Kaiser following approval of building permits for the store and gas station by the county, according to planning documents filed by Kaiser. Beeler said buying the land “could give (Costco) some liability” in the cleanup process, which began with an initial site study in 1988. Area homes and businesses are connected to sewer and municipal water. The new Costco would hook up to those systems and avoid contaminated groundwater. 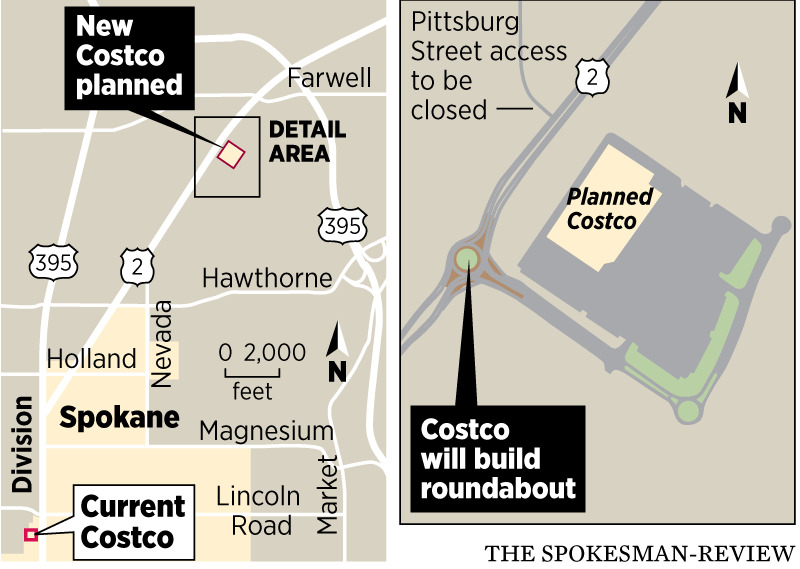 Costco has agreed to construct the multilane roundabout on Highway 2, with a portion of the costs being covered by bonds issued by Spokane County. As part of the plan, the existing Pittsburg Street will end in a cul-de-sac near the site of the future roundabout. That street provides entry to the neighborhood surrounding Camelot Park, where longtime resident Kathy Spencer said she was worried the road changes would add significant traffic to an area without sidewalks and many children biking in and around the park. Spencer said most neighbors would be fine with the Costco if traffic it generates flows to U.S. 2 and the North Spokane Corridor. “But the congestion is going to force people who don’t to go through that roundabout through our neighborhood,” she said. Spencer said she lived on a corner close to the park, and even without the Costco she described “several close calls” between cyclists and motorists in the area. Kerns, the county commissioner, said the organized response in opposition to roundabouts farther north on Highway 2 could be a precursor of community angst about the proposed Costco roundabout. The Department of Tranpsortation expects construction to take place this summer to coincide with the building of the new warehouse. “I don’t think a whole lot of folks know yet there’s a roundabout going in there,” he said. Published: May 27, 2017, 5:30 a.m.